Epidemic • Utah mom joins D.C. protest demanding feds reduce painkiller deaths as health officials say numbers skyrocketing. 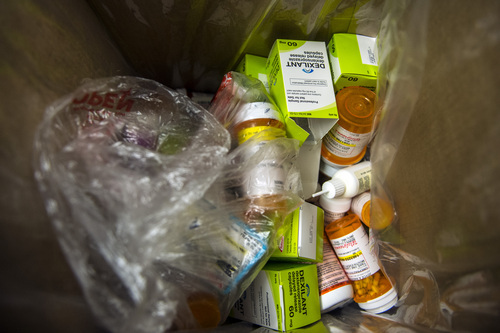 Chris Detrick | The Salt Lake Tribune Unused prescription drugs are dropped off at Smith's Food and Drug in West Valley City Saturday September 27, 2014. Utahns who wanted to get rid of unwanted, expired and unused prescription drugs could drop them off Saturday at 12 Smith's Food and Drug stores in Utah, Salt Lake and Davis counties. Smith's is teaming with the Drug Enforcement Administration to collect the medications, no questions asked, between 10 a.m. and 2 p.m. Chris Detrick | The Salt Lake Tribune West Valley City Detectives Scott Arnold, left, and Tony Wolfgramm collect unused prescription drugs at Smith's Food and Drug in West Valley City Saturday September 27, 2014. Utahns who wanted to get rid of unwanted, expired and unused prescription drugs could drop them off Saturday at 12 Smith's Food and Drug stores in Utah, Salt Lake and Davis counties. 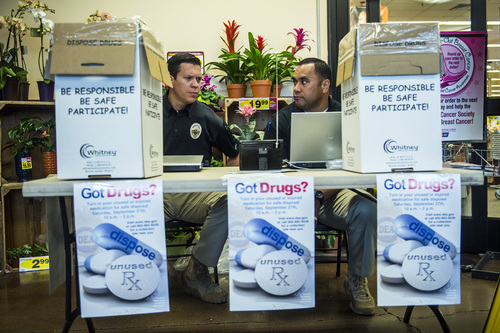 Smith's is teaming with the Drug Enforcement Administration to collect the medications, no questions asked, between 10 a.m. and 2 p.m. Chris Detrick | The Salt Lake Tribune Unused prescription drugs are dropped off at Smith's Food and Drug in West Valley City on Saturday. 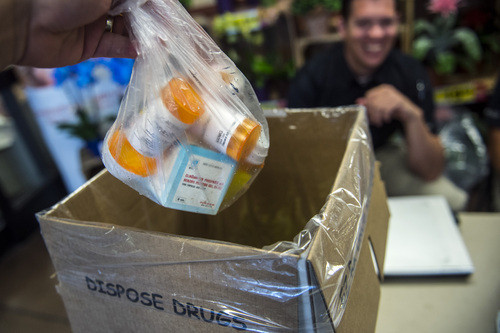 Utahns who wanted to get rid of unwanted, expired and unused prescription drugs could drop them off Saturday at 12 Smithís Food and Drug stores in Utah, Salt Lake and Davis counties. Smithís is teaming with the Drug Enforcement Administration to collect the medications, no questions asked, between 10 a.m. and 2 p.m. Steve Griffin | The Salt Lake Tribune Sandra Kresser of Salt Lake City will be in Washington D.C. Sunday to participate in the Fed Up! Coalition's second annual rally calling on the federal government to help end the opioid/heroin epidemic. Kresser holds a photo of her son, Josh, who became addicted to Oxycontin after receiving the prescription for two herniated discs in his back. He eventually died of a lethal combination of drugs, all prescribed. Monday would have been Josh Kresser&apos;s 33rd birthday. Instead, Tuesday is the eighth anniversary of the day he died of an overdose after taking three drugs precisely as a doctor prescribed. 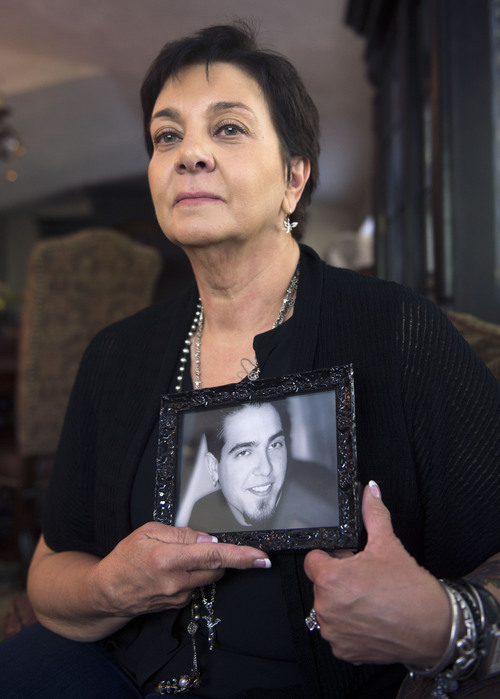 The reality of his death  and the 2 1/2 years of addiction hell that preceded it  still anger his mother, Sandra Kresser of Salt Lake City. She&apos;ll be in Washington on Sunday with hundreds of other parents, consumer advocates, medical experts and addiction treatment providers for the second Fed Up! rally urging federal reform. "We&apos;re fed up with the addictions and the deaths," said Kresser, who is treasurer of Advocates for the Reform of Prescription Opioids and the Fed Up! coalition. The coalition sent a letter to Sylvia Burwell, secretary of Health and Human Services, asking her to change leadership at the Food and Drug Administration last week. The advocates also want a moratorium on the agency approving new narcotic painkillers. The FDA in October approved new opioid painkiller Zohydro, a move anti-addiction advocates and 29 state attorneys general, including Utah&apos;s, criticized. "The FDA needs to be reined in," Kresser said. Both the Centers for Disease Control and Prevention (CDC) and the Utah Department of Health call the rise in deaths from prescribed painkillers such as Oxycontin, Vicodin and methadone an epidemic. By the numbers • Forty-six people die every day in the U.S. from overdoses on pain medications, the CDC said in July. In Utah, 268 people died from accidental overdoses of opioids, or prescription pain meds, in 2012, an average of 22 per month. That&apos;s the most recent year for which statistics are available. That year, 589 Utahns died of drug poisoning  tallying deaths from drugs of all types  which put Utah in fifth place in the country for the number of these deaths per 100,000 people. The number is greater than people who died in car crashes  roughly 205  and falls, at 216. Most of the 317 firearm deaths were self-inflicted, said Jenny Johnson, a Utah Department of Health injury-prevention coordinator. 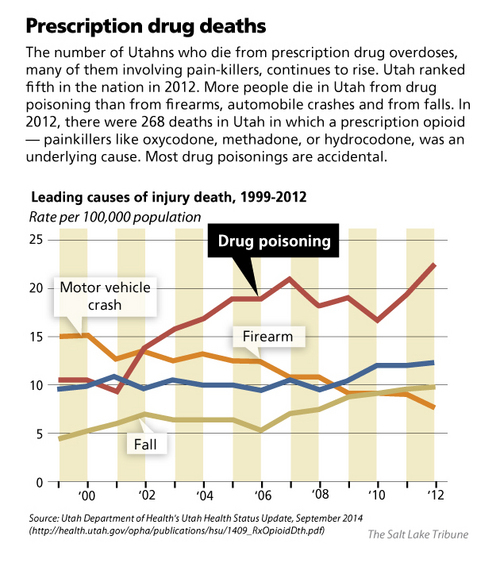 Utahns in the 45 to 54 age group had the highest rate of death from prescription pain meds, at 25 per 100,000 people. The statistics also don&apos;t reflect the number of people dying of heroin overdoses, though many who become addicted to prescription painkillers switch to the illegal  and cheaper  drug. In 2012, 95 Utahns died from illegal opioids such as heroin, according to the state health department. A deadly combination • Josh Kresser&apos;s addiction began as many do, with an injury, his mother said. The 2000 graduate of Judge High School slipped carrying meat to the smoker at a barbecue place where he was working at age 22. He&apos;d never been a drinker, or addicted to drugs, but the Oxycontin prescribed for two herniated disks swiftly took over his life, his mother recalls. "It really hijacked his brain," she said. He overdosed five times  including twice on a mixture of cocaine and heroin  over the next 2½ years and spent 404 days in rehabilitation centers. Josh Kresser had just finished his third inpatient treatment program, this time in California, and was living in a recovery house when a neurologist who knew his history prescribed him three drugs: one for his continuing back pain, one for anxiety and one for insomnia. "None of the levels were lethal but it was the combination that ended my son&apos;s life," Kresser said. An autopsy affirmed that he took the drugs as prescribed, his mother said. "Josh&apos;s story is one of tens and tens of thousands that play out every year in this country," Kresser said. "My goal is to spare another parent." Johnson at the health department said that although the problem is not an easy one to fix, Utah did see a decline in drug-poisoning deaths when the state was putting more money into prevention. The "Use Only As Directed" awareness campaign was part of that. But legislative funding for that ended in 2010 and drug poisoning deaths rose in 2011 and 2012, she said.